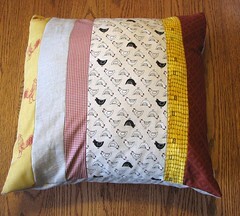 I made a version of this pillow for a recent swap. It was a very fun idea -- you send your partner a book she'd like (I sent two vintage Gladys Tabor books) and make a few things to accompany the book, based on the theme of the book. In addition to the book, I sent a little needlebook with roosters, goatmilk soap, and a few vintage chicken goodies. I love working with patchwork fabrics and papers. It allows me to work with all sorts of different patterns and textures. I'm constantly amazed at how compelled I am to work with these materials. Whenever I make something new for a swap, I try to make at least one extra for the Etsy shop. 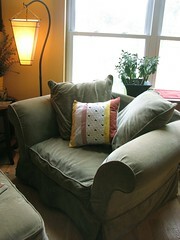 So the 2nd pillow is now in the shop waiting for a new home. The pillow is lovely. You sound like such a wonderful swap partner! I like the pillow, and that sounds like a great swap package. You're such an awesome swap partner!